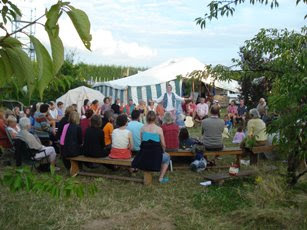 I have just returned from the Resurgence Summer Camp held at the Green and Away tented conference centre in Worcestershire. I hadn't been before and was a little apprehensive at what I would find. In the end I came back on an emotional high, not an ecstatic or adrenaline filled high, but a deep feeling that I had at last made some deep connections within me that had been yearning to find a home. I could write at length about many things, but perhaps they will evolve into further blogs. Instead I offer a summary of notes from my notebook and a glimpse into some personal experiences. A great campsite: vegetarian food, all meals outdoors, wood-burning showers, solar power, compost toilets, camp fire and all intimately surrounded by trees. The Sweat Lodge and subsequent mud bath! I had been apprehensive about this but after chatting with someone I went along. It was great, only about 10 of us, but it was well lead and I felt no sort of scary spiritual undertones. It was very dark, very hot and great fun! Wildflower walk: we were all given magnifying glasses and went to see what flowers we could find around the campsite. Everyone found this fascinating. Conversations. I had too many to remember! The meeting on daily spirituality. I was deeply moved by this gathering/sharing when we all stood together to hold hands. Don't know why, but I wanted to cry! Perhaps I was feeling no longer alone and some of the people had walked a path similar to that which I have done (as had others on the camp). We were joined by a butterfly and a baby toad by the way! Labyrinths being a form of body meditation and prayer (not that I walked the one there though). An apple tree shows unconditional love: all are welcome to have an apple, humans, birds, wasps and worms etc. Love is not the same as liking. Make beautiful things - slowly! Why waste finite materials to save infinite time? The camp was gift to me to appreciate and unwrap. I could have done much more, listened more, spoken to people more and thought more, but I did what I did and I feel profoundly moved. Thank you to all the people I met, to all who organised it and to the whole of Nature and the Great Creator for being there for us. Oh, how exciting! I look forward to you sharing more of your experience. How long were you there? Wow, you got to shower in the outdoors...lucky! What sort of things did you learn? Oh, please share!